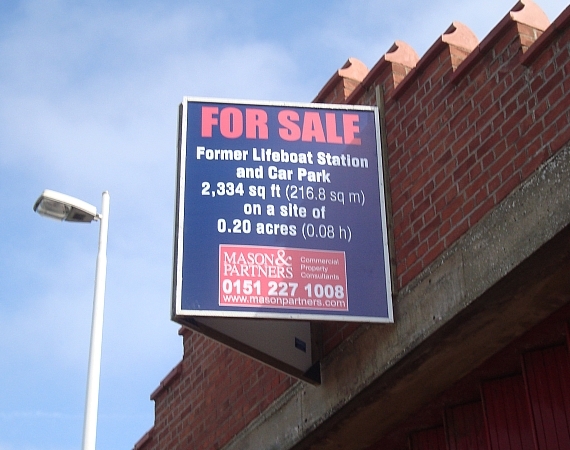 The old Hoylake Lifeboat Station has been put up for sale along with the adjacent car park. It is my understanding that the building is owned by Peel Holdings and the car park is owned by Wirral Council. I am attempting to find out the asking price. Lifeboat volunteers had expressed a view that the building could be used as a local RNLI museum. There have also been speculative enquiries about the possibility of turning the building into a restaurant/wine bar. I was surprised to see the ‘For Sale’ board going up, which means it will surely be sold to a developer, who will build yet another block of flats which are not needed at the moment. The details are so far unavailable on the Estate Agent website re; price etc. I was lead to believe that it was going to be turned into a RNLI museum/shop, which as it’s a ‘listed building’ would be a much better outcome for all. A lifeboat has been stationed at Hoylake since 1803 long before the RNLI was formed in 1894. So it would be a shame to loose this iconic & historic building. How is it that Peel Holdings own the site, is it a throw back from M.D.&.H.B. days? Yes, Peel Holdings bought Mersey Docks & Harbour. I was prepared to lead a project to acquire the old station and turn it into a Hoylake Lifeboat Museum, operated by a charitable trust. I restored the last Hilbre Island lifeboat, Chapman, now 109 years old, and also own the lifeboat we had in Hoylake in the 1970’s, the Thomas Corbett. She needs a lot more work. I asked both the Wirral Globe and Hoylake & West Kirby News if they would like to support a campaign to set up a Lifeboat Museum, they didn’t even bother replying. I put a message on this web-site inviting interest….lots of people think it’s a good idea but they don’t actually do anything. I had no interest in being involved expressed by anyone. People will just complain if the iconic building is eventually pulled down or turned into a carpet warehouse, which is one of the potential fates which await it. We could have a superb museum but I cannot do it on my own. I have the historic boats, the lifeboat models exhibited on Lifeboat Day, an impressive collection of books and magazines on the RNLI going back well over 100 years….a Museum in need of a building! THERE IS STILL A CHANCE OF PURSUING THE LIFEBOAT MUSEUM PROJECT BUT I NEED VOLUNTEERS PREPARED TO GET INVOLVED. I WOULD WELCOME RESPONSES THROUGH THE HOYLAKE JUNSTION WEBSITE. I have worked on projects to save things for Hoylake for 40 years now and am afraid to say poeople want these things but are not prepared to pay for them. The Boating Lake is the latest prime example. We held a Public Meeting, persuaded the Council to agree to it being saved and a small group of Residents said they would fundraise for the £18,000. Since September we have raised £15,000 but need the rest. We have appealed on this site, given out notices etc, but people do not donate very generously they just moan. Our next attempt to extract money is May 1st with a Concert in St Johns Church, Meols and then at the Open Day for the Lake on Sunday May 9th. Hopefully we will then be able to pay off the debt. I grew up in Hoylake. Left in 1958 to a new life in America. I now live in Texas. I well remember the old lifeboat station and the yacht club nextdoor. The Winter Gardens and the matinees on a Saturday afternoon as a child. So many wonderful memories of my childhood and growing up in a safe harbor. My family home was on the Parade and not far from the “Baths”. How awful to have found out that the “Baths” were demolished. So many great memories there. It is true that one should never go back. I hope that you are successful in saving the lifeboat station. Once its gone its gone. Heritage should be saved and savored. Interesting to see that the site of a former promenade shelter house and hence a part of the promenade ‘public realm’ is now described as a car park and deemed to be a redundant asset suitable for disposal. The indicative plans drawn up by consultants up for the promenade talk about iconic sculptures etc. Well, this is perhaps the best place for such a statue dedicated top the Hoylake lifeboat crews. What a wonderful thing to have saved two of Hoylake’s lifeboats including an original from the Hilbre station!! What a wonderful focus for a museum they would make. Where are they? As Hoylake is one of England’s oldest stations pre-dating the RNLI, Hoylake would be a fitting place for a ‘Lifeboat Museum of the North’ with room for an additional building on the old shelter site. Lottery, NWDA, RNLI? Who I wonder could help? I am the owner and restorer of the 1901 former Hilbre Island lifeboat”Chapman”, the last to be stationed on the island and oldest surviving Liverpool-type lifeboat, the familiar design which once formed the back-bone of the RNLI. I also own our 1970’s lifeboat “Thomas Corbett” which I brought back from Ireland. She needs considerable work but “Chapman” is ready for exhibition. I would be intersted to hear what your plans are now for the restored ‘Chapman’, would you have any plans to return it to its home, Hilbre Island? What’s new with the old Lifeboat station? Any further developments? Great work John any support we can give we will. Do you have an email address. We need to speak to someone who can tell about the extensive network of lifeboats and stations maintained by the Liverpool Dock Trustees late MD&HB around Liverpool bay. We also need to borrow a model of an early lifeboat to display in Liverpool Parish church of Our Lady and Saint Nicholas during the National Merchant Navy Day service on Sunday 2nd September 2012. I would be willing to help with your scheme as much as I can. I contribute on local marine matters to BBC Radio Merseyside on a regular if small basis. If you feel you would like me to mention your efforts and plans perhaps you would get in touch and we can see how I could help and what would be best for you.